Temperament: How Music Became a Battleground for the Great Minds of Western Civilization , by Stuart Isacoff, Vintage 2001, 277pp. Mr Isacoff does not make the simple numeric point the way I do. Instead he has many diagrams of piano keys with dots on them, which I found unhelpful. The author is less good at clarifying issues, but very good at showing their complexity. He has even added an appendix, in reply to the furious comments that this whole topic seems to provoke, saying that he does not prefer equal temperament, but merely points out some of its good features. The story is all over the place, covering topics as diverse as tableware and Indiscreet Jewels . I would have enjoyed it more if I had felt that the author was really an expert historian instead of browsing at random and making the occasional facile comment. It would probably come off better in a lecture. A book like this necessarily gives you some good factoids. There are 22 tons of tension on your piano strings. I did not know that the ut-re-mi syllables came from Ut queant laxis via a certain Guido. And the multiple strings that a piano's hammer hits are intentionally out of tune. I told this to my piano teacher last night, who of course knew that and more, leading him to play me a resonance-based piece he composed involving shouting into his beautiful Steinway grand -- which shouted the words right back. I am sorry that our Clavinova at work does not have an option for different tunings. I feel a little bit haunted by the words of some people in this story, saying that equal temperament is like junk food -- just good enough to be popular. Have we lost something by not hearing perfect fifths and thirds? 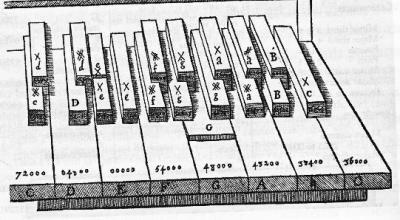 It would be fun to play around with different tunings easily, and to have a pure-sine option for the timbre along with harpsichord and whatever, to see how odd things sound without overtones. So playing with different tunings if you have a clavinova isn't even hard. 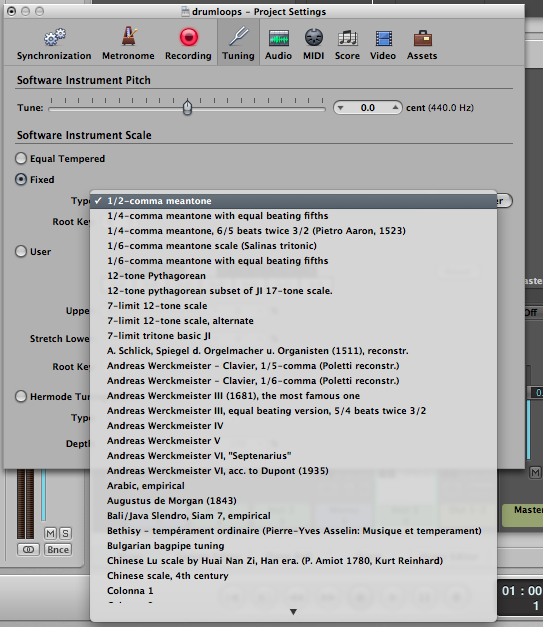 With a Mac and Logic Pro , there are about 150 distinct soft instrument fixed tunings in place. You can even geek out on the microtuning stuff (where, for instance, the piano is tuned with a 1/4 note between keys so you get one ocatve between two cs). Screen shot attached. If you still run a pc, I refer you to the canonical advice. I thought Anathem was a blast, too. Giovanni wrote: I hear the same strange background noise in the wiki examples. I don't think they're very good. Also, on Isacoff's own website, he claims that the "calamity" is played in a different key than the original example, which it isn't, as I'm sure you can tell. Have heard a couple of concerts lately played on pianos tuned to a different temperament (Murray Perahia is one who has taken up the gauntlet). They were quite interesting. Sorry to hear you're giving up lessons -- say it ain't so! Jay wrote: Very interesting book. I've been aware of the various notions of tuning, but hadn't realized tuning had sparked historical debate. I've had the same lingering doubt re equal temperament you express in the last paragraph, but the incredible beauty and richness of the piano repertoire strongly suggests it is not a problem. I did hear some background hiss on the Wikipedia samples. In listening to these samples, I listen for the beating, much as when I tune. The frequency of the beats tells you the number of cycles/second by which the two notes differ. I could hear the beats on the notes that are 6 cents apart, but the sample was too short to hear them on the notes that are 1 beat apart. Scott wrote: This book sounds awesome! I can't hear a 10-cent difference, either. FWIW, several years of guitar lessons only got me to the point of being "OK". I have a good ear, but my fingers don't cooperate; the good musical ear just makes my shortcomings more painfully obvious. Lucy wrote: The book sounds interesting, thanks for the review. I'm reading Musicophilia by Oliver Sacks, author of The Man Who Mistook His Wife For A Hat . If you are still reflecting in how music influences our lives Sacks certainly writes fascinating case studies of musical experiences. I'm surprised to hear that you are giving up piano lessons. Mind, you don't have to give up playing! Sean wrote: Given that Willaert predates tonality, his motet can't show up problems with the cycle of fifths. And in fact, it doesn't do that. I replied: You can argue with this guy! "An interest in theoretical questions is indicated by references to him in Spataro's correspondence as well as by a composition of his from the time of Leo X, Quid non ebrietas,in which the tenor falls through the circle of fifths, ending on a written seventh to be changed by musica fictato an octave." Sean replied: Hehe. Well it moves through the cycle of fifths certainly. The fact that it ends up where it started off shows that Willaert was harmonically ahead of his time. The guy above doesn't understand what's happening, which is why he calls it "musica fictato". Consider: C->F->Bb->Eb->Ab->Db->Gb then what? Well we would say B->E->A->D->G->C because we have Equal temperament so sharps and flats are the same. Say you don't think that, so you go Cb->Fb->Bbb->Ebb->Abb->Dbb. Dbb to C is an octave of course but your guy above thinks it's some kind of seventh because he doesn't understand you can have multiple enharmonic spellings for any given note. If you go round the cycle the other way you do the same thing, but sharpening each time instead of flattening. This isn't a problem with the cycle, it's a question of definition and the state of generally understood musical theory. Temperament exacerbates this because long before you got all the way round the cycle you would leave key areas which sound good in your quarter-comma meantone or whatever and it would all sound so wrong you would just go back.